Shares of A.O. Smith are having their worst year in over a decade, but its business prospects and management's outlook don't merit such a decline. After watching A.O. 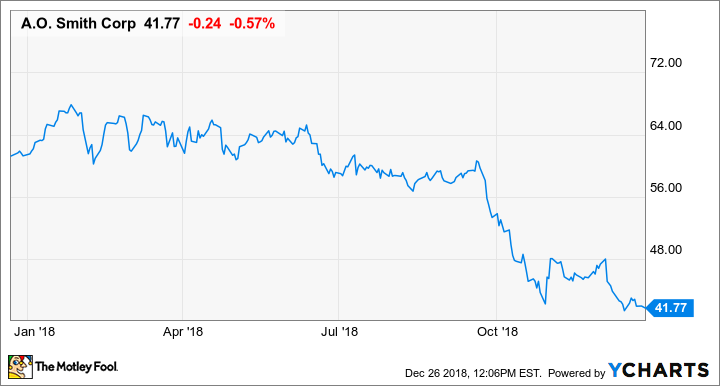 Smith's (NYSE:AOS) stock drop precipitously over the past several months, there's a good chance that doubt about the company's future has crept into investors' thoughts. Management didn't assuage those concerns last quarter when it reduced full-year guidance significantly because of the trade war with China and rising raw material costs. But even with these issues at the forefront, management's most recent conference call was far from dour. While it acknowledges that this isn't the best time to have serious exposure to China, it still sees a better 2019. Here are a few snippets from the company's most recent conference call and what investors should make of the business and the most recent stock drop. Everywhere you turn, it looks like A.O. Smith's sales are about to hit a wall. China, its largest growth catalyst, is showing clear signs of a slowdown, and raw material costs are on the rise. These concerns have a real possibility of curtailing the company's top-line growth. On the call, though, recently appointed CEO Kevin Wheeler gave guidance for 2019 that anticipated modest growth: "Given the depreciation of the China currency, we expect a $50 million headwind to sales and over $7 million to earnings if the currency rate stays where it is. Combine that China projection with a full-year price for North America water heaters, a full-year Lowe's water treatment business, and the remaining businesses growing similarly to the recent past, we project organic growth in 2019 of 5.5% to 7% in local currency and 4% to 5.5% in U.S. dollar terms." Given all the headwinds the company faces, mid-single-digit growth sounds like a rather ambitious goal. What makes it a possibility is that water heater sales in North America are incredibly resilient. More than 80% of sales are replacements of existing systems. Management makes a point in its investor presentations to show that replacement sales remained resilient through 2008-2009. As the market share leader in both residential and commercial heaters and boilers, management has the ability to raise prices rather easily to offset high raw material costs and any other weakness. The questions analysts wanted to ask on the most recent conference call were largely about China and the impact of the recent trade war and subsequent economic slowdown there. While management acknowledged that there were some clear headwinds, it was confident that the longer-term trends that have fueled its 21% annual sales growth over the past decade are still in place. China and the U.S. need each other. We've talked to a lot of consultants, I mean, there is a possibility this thing gets resolved at the G20. If it doesn't, I think the thought process is sometime early to mid next year it does get resolved. And so we certainly think as [CEO] Kevin [Wheeler] said, you have a growing middle class. You have the urbanization going on. You have household formation. And right now the consumer is saving, we've got that from some of our banks because their confidence is down. But we do think going forward certainly a 7% or so [growth rate] once we get through this hiccup, if you will, it's achievable -- total company. These three trends -- urbanization, a growing middle class, and household formation -- are immense levers for the company to pull in both China and India. Management estimates that this consumer demographic has grown more than 10-fold since 2010 and will likely continue to grow rapidly for at least another decade. The water heater business is a resilient one that churns out cash, but it is a narrow scope that management has supplemented over time by acquiring businesses in adjacent water technologies. One that has thus far proven successful has been residential and commercial water treatment technologies. A.O. Smith had zero presence in this industry less than a decade ago, but it has now grown to $500 million a year in sales, thanks to acquisitions and new product offerings. That business is likely to get even larger, as the company recently signed a deal to be the primary water treatment brand at Lowe's home improvement stores. On the water treatment side, I think we've demonstrated that there are opportunities as we've entered this particular business segment. If you look back several years, we didn't even have a water treatment business, and through acquisitions in China and then recently with the acquisition of Aquasana and Hague, we've been building that portfolio. It certainly widens our lens for the ability to look for acquisitions that will complement the other parts of the business. So the answer is, is it, our lens is wider? Absolutely. Are we continuing to look for opportunities that complement our business and also enhance our capabilities? The answer is yes. And we'll continue to look for those and we'll -- again we have to look for the right business, the right return, and the right fit for our company. But certainly there are opportunities out there for our business to expand in water treatment and to acquire additional companies going forward. One business of particular interest lately has been expanding its air purification and treatment options in China. With air quality a significant concern in urban areas, its limited selection of air treatment offerings in the country have grown at rates even faster than its water heater and purifier business. With the company sitting on more than $600 million in cash and short-term investments, investors shouldn't be surprised if we see a bolt-on acquisition or two in the coming quarters. Even though there are some apparent headwinds in the near term, the company is by no means in bad shape. During the worst of times, it can rely on the replacement water heater business in North America for a reliable source of earnings. The company also has other growth levers to pull if its China business shows signs of strain in the near term. With a great balance sheet on top of it, this is a great business in good shape today. Don't tell that to its stock, though, which has declined more than 30% so far this year. You could have argued that the stock was looking expensive earlier this year, but now it trades at 21 times earnings. That's the cheapest it has been in half a decade and represents one of the better chances to buy this company in a long time. For investors who have been looking for a time to add A.O. Smith to their portfolio, now is that time.